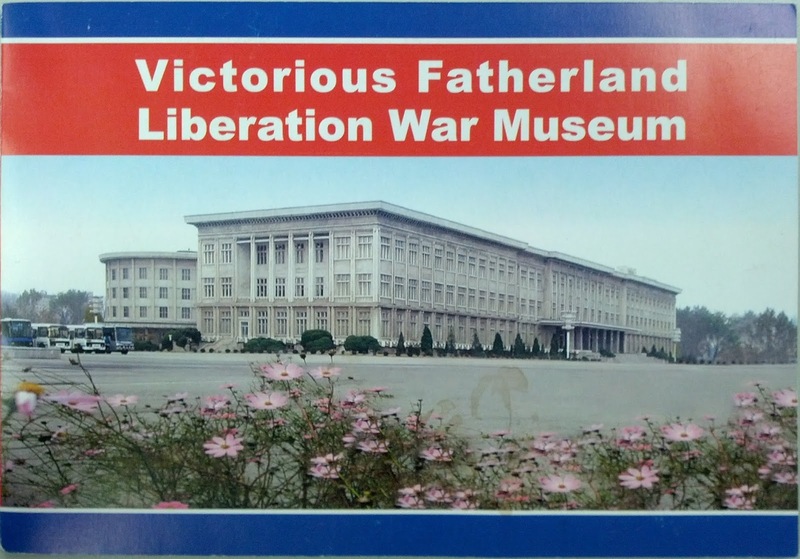 This amazing lesson utilizes incredibly RARE, hard-to-find documents from a North Korean museum guidebook to analyze the Korean War from North Korea's viewpoint! 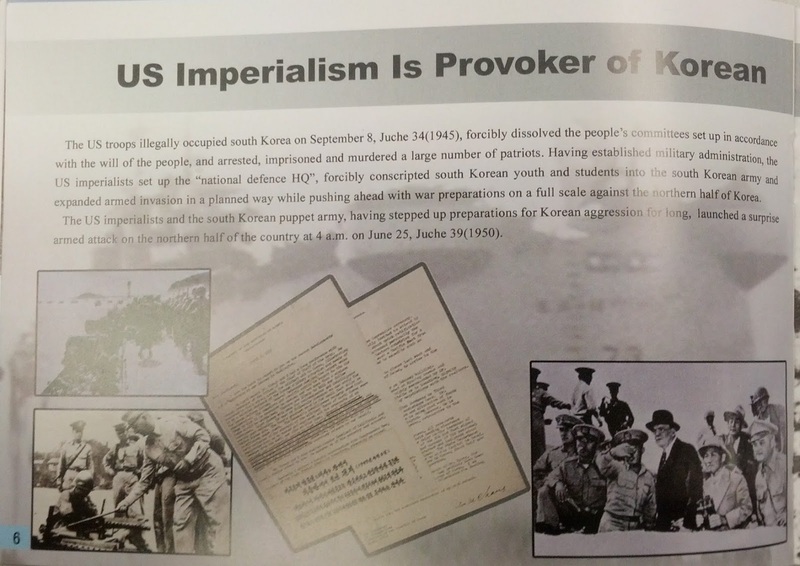 These documents give a fascinating insight into the hyper-propagandistic perspective of North Korea and why the current regime is so antagonistic toward the United States. With the current tension over Kim Jong-un's threats and missile tests, this is a wonderful resource for you to use in your classes! 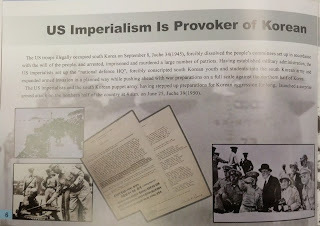 "Long live peerless Patriot General Kim II Sung!" "In Defence of Azure Sky of Fatherland"
"What awaits US imperialist aggressors is only defeat and death!" 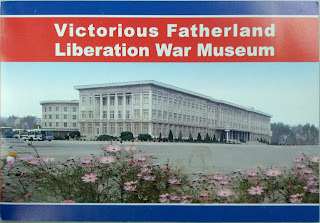 Included in this download is a 2 page worksheet, 1 page of directions and suggested lesson extensions, and 20 pages of documents from the "Victorious Fatherland Liberation War Museum" in Pyongyang, North Korea (DPRK)! You can download this entire resource here. It is truly a fascinating lesson that can be adapted for AP or IB classes down through traditional middle school students based on the suggested extensions and included resources! I've had a great week and wanted to celebrate and thank everyone out there who has supported me, the blog, and my store! I just posted a new worksheet reading on modern ethnic and religious conflicts around the world that will be free to download for the next 24 hours! As my classes are finishing up our content before state assessments begin and moving toward more reviews. A great resource for short video biographies is the Youtube channel of The Cloud Biography. Each of their videos are between 2-4 minutes and highlight the essential things students need to know. They seemingly have hundreds of videos on almost every major person from World and US History - including some that are hard to find good information for. I posted a bunch of them to my class' Blackboard site for students to view at home and will show a couple on the most important people in class. Fantastic because they take up very little class time, but are focused on good content! 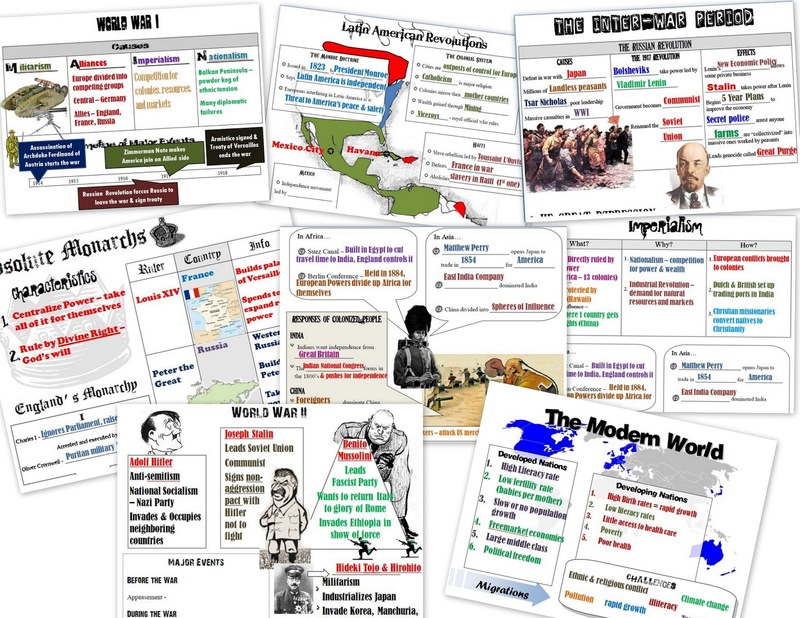 EVERY Resource to Review US History! 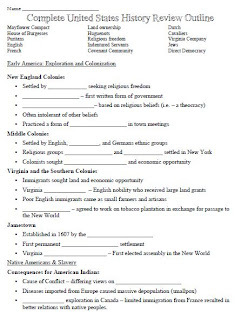 This amazing set of review materials is everything you need to get your American or US History students ready for a final exam or state assessment! 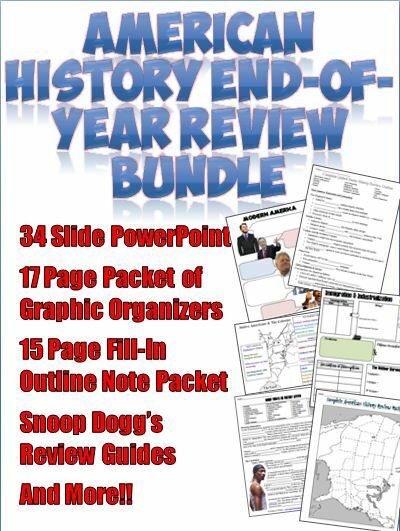 The Ultimate American History Review Packet and Notes - a 17 page packet and 34 slide Powerpoint that covers ALL essential information students need to know about ALL of American History! 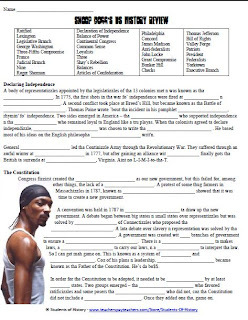 The Snoop Dogg Review Guide Bundle - all 4 Snoop Dogg American History cloze review guides. 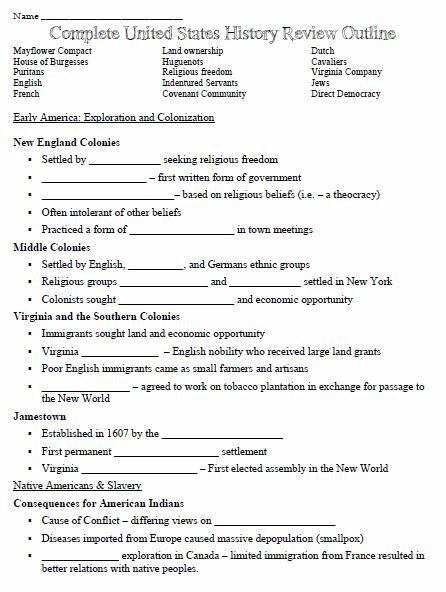 The Early American History Vocabulary Word Search Review - to cover early vocabulary. 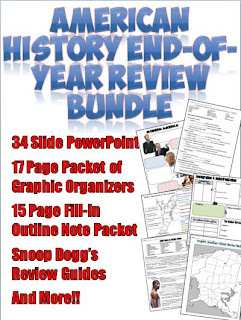 Plus 2 bonus review guides on important quotes from US History AND 2 bonus 50 Question practice exams! Both exams could serve as amazing final exams for your class! All of these have helped me to have among the highest pass rates in the county on our state assessment! 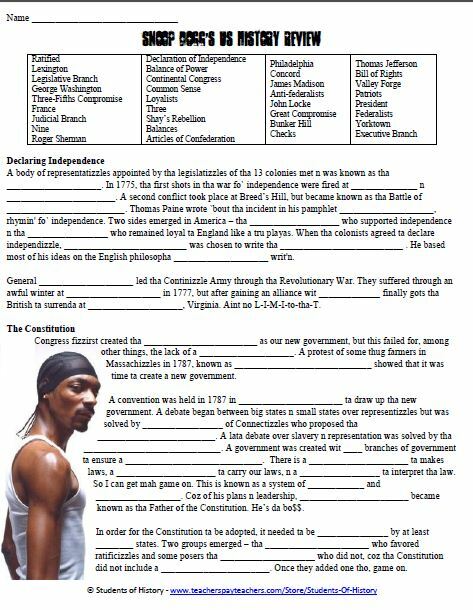 Each is fantastic for visual learners, ELL, and special education students because it breaks down complex topics in US History in simple ways students can understand. I promise you these are fantastic review materials that will DEFINITELY help your students prepare for an exam! This is a fantastic, visual lesson on America and the Soviet Union's Space Race during the Cold War! It includes 11 one-page readings on key events in the space race that students use to create newspaper pages. Students then present their newspapers and create timelines to see how the Soviets and Americans progressed. Everything you need for this lesson is included: easy to follow directions, a great newspaper template, all the readings, samples, and an answer key. The events include: Sputnik, Laika the Dog, John Glenn, Yuri Gagarin, Neil Armstrong, the Voyager, Hubble, and more. This can be differentiated in your classes by having students work in pairs, groups, or individually. I love it because it captures the artists, writers, visual and kinesthetic learners all in one lesson! You can find more pictures of this lesson here on Facebook. While there, you can "Like" my page on for updates, free giveaways, links, and more! Thanks! This amazing lesson features a PowerPoint on America's Founding Fathers filled with Harry Potter-style "magical portraits" that move, blink, smile, and look around your classroom! Turn a boring PowerPoint into a dynamic activity that will engage your visual learners and have your students gasping when they see Thomas Jefferson smile and wink at them! I promise they will be howling with delight! The PowerPoint includes a warm up, notes for each founding father, and 7 moving video portraits of George Washington, Thomas Jefferson, John Adams, Ben Franklin, James Madison, Alexander Hamilton, and George Mason! The videos are also separate files that you can insert anywhere or use in any other resource. You can download this lesson as a zipped folder by clicking here. 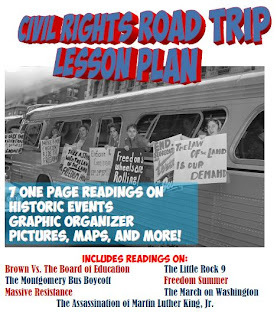 Take Your Students on a Civil Rights Roadtrip! A great activity for engaging kinesthetic learners and students who have a hard time focusing is to get them up and moving around the classroom. 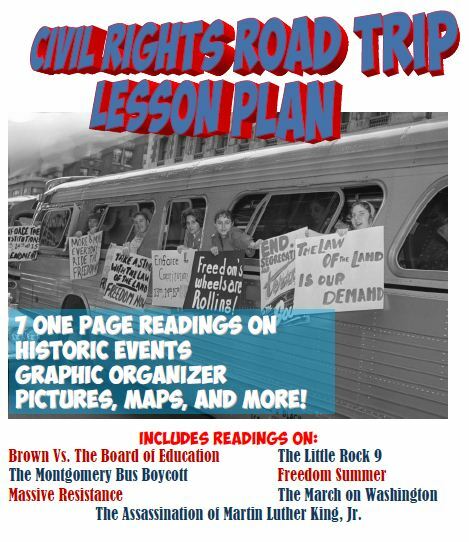 For this new lesson on major events of the Civil Rights Movement, this theory is paired with the famous Freedom Riders who traveled the South registering voters. 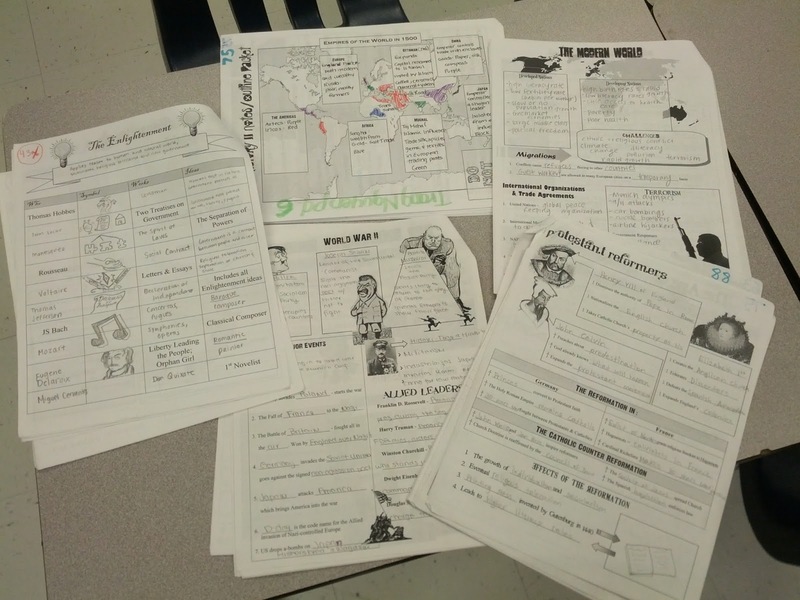 As your students stop and read about each event, they complete a graphic organizer and map each event. This is a great activity to get students moving around the room. It can also be completed in groups, or used for student presentations. A completed example is included as well as several additional ideas on how to present the lesson. You can download this lesson for use in your class by clicking here. New Dinner Party Seating Lessons! One of the most difficult things about planning a wedding is the seating arrangements. My wedding had tables of 8 and we struggled to put together groups with things in common who would enjoy each other's company. 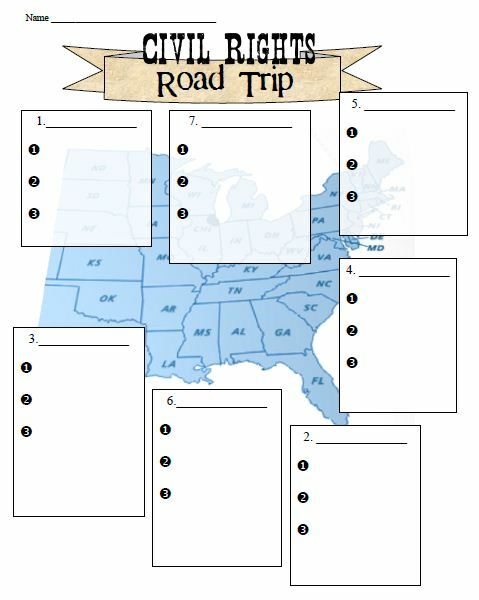 This process got me thinking that this would make for a great lesson plan! Students have to think critically about various figures in history to seat them at a table with things they have in common. It makes for a great review after presenting information on a lot of people. In this one, students seat 8 Cold War figures in down to dinner to help ease Cold War tension. Your students will have to think critically about the ideas that each shared in common and who would not get along and turn the dinner "frosty". Lastly, for American History, I created this lesson for a Gilded Age Dinner Party that includes both Robber Barons and Progressives. Like in the French Revolution lesson, students read biographies of 8 people and must think critically to seat them next to others and justify their seating arrangements. 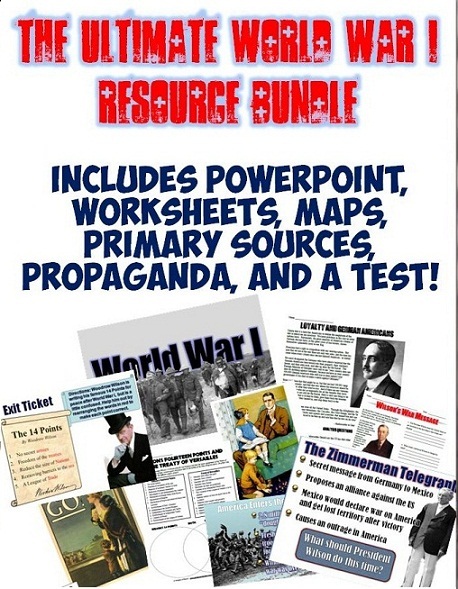 This fantastic bundle includes an incredible set of resources for your World War I unit! 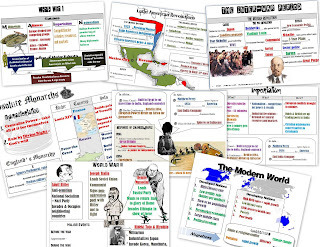 I have been using all of these in my classes for a number of years to fantastic success when I teach about WWI. I promise, the PowerPoint above is one of the best presentations you will ever use! It covers absolutely everything you need to cover for the Great War and can be spread over several periods. All of the included worksheets are great for supporting learning and are based on essential learning standards. As a bonus, I also included several additional worksheets not on TpT, a full test and answer key, and a webquest! 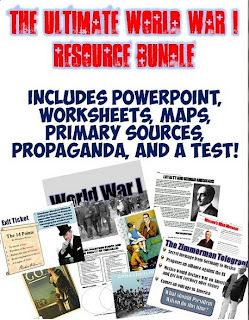 All of the combined resources would be $18 not including the additional resources, so this bundle is an incredible value! You can download this unit plan by clicking here. 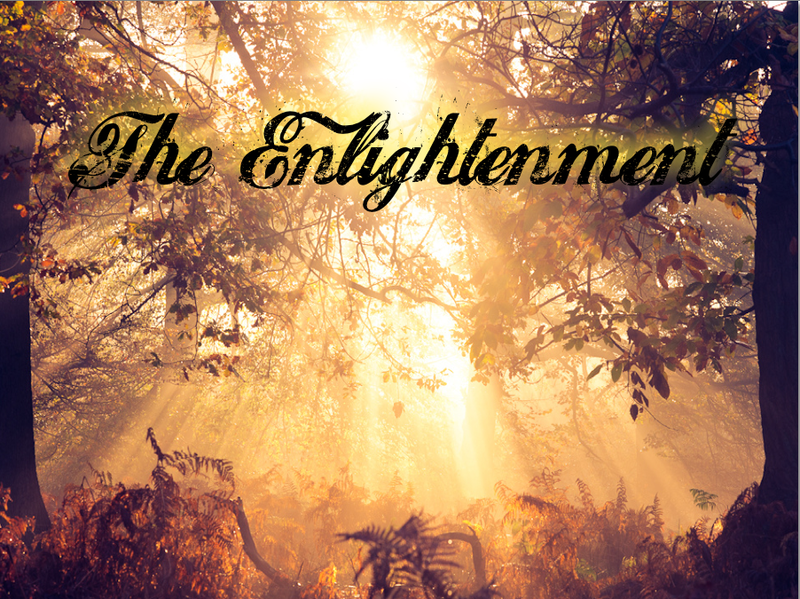 The Age of Enlightenment has always been an important but dry topic for my students. To help make things more engaging, I created this beautiful PowerPoint Lesson which you can download for FREE here. Students create a foldable book in which we draw pictures and take notes on 5 Enlightenment thinkers: Hobbes, Voltaire, Locke, Montesquieu, & Rousseau. This visually stunning powerpoint contains the process for making the book as well as notes, quotes, and an exit ticket for students. It covers all Common Core Standards material from World History on the Enlightenment, but in a simple way for students to understand. This fantastic FREE lesson can be downloaded here. As a culminating activity, my classes complete the "Enlightenment Salon Party" activity which you can download here. 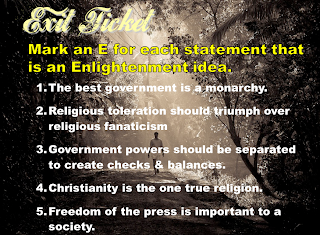 This allows them to think critically about each philosophers ideas, find similarities, and use real-world processing. Thank you for looking and hope you enjoy! Prior to showing this video, we do a lesson on the Berlin Blockade as a prelude to the wall being built and I include this great story about the American pilot Gail Halvorsen, nicknamed "Uncle Wiggle Wings the Candy Bomber" because he parachutted bags of candy to the children of West Berlin. A great little history story for students! Here is a compilation of some amazing color footage from the D-Day invasion of Normandy, France (Operation Overlord). George Stephens, a film maker during the war, took the footage with other cameramen hoping to use it in a documentary. In my class I showed this as part of an amazing Apple Keynote presentation I put together on the major battles of World War II. You can download this file here for use on your Mac computer. There are some wonderful capabilities Keynote has that PowerPoint does not. I definitely recommend trying it out if you have the chance! This beautiful PowerPoint presentation covers the period of English history after the death of Queen Elizabeth I through the reign of William and Mary. In simple, visually engaging slides, each monarch (and Oliver Cromwell) is reviewed and their struggles with Parliament are highlighted. It includes slides on James I, Charles I, Charles II, Oliver Cromwell, the Commonwealth period, Charles II, James II, and William & Mary. All of which are fantastic and informative for your students, but can also be modified to fit your needs. This also includes a warm up and exit ticket to review your student's understanding of the lesson. You can download this lesson here. Hope you enjoy it! This review packet is by far the best way to get your students prepared for a final exam! It includes a complete 19 page packet and 37 slide PowerPoint presentation on a complete year of material. I usually take about 2 weeks and cover a few pages a day and my students always do amazing on our state assessments. You can download this complete bundle with everything included by clicking here!